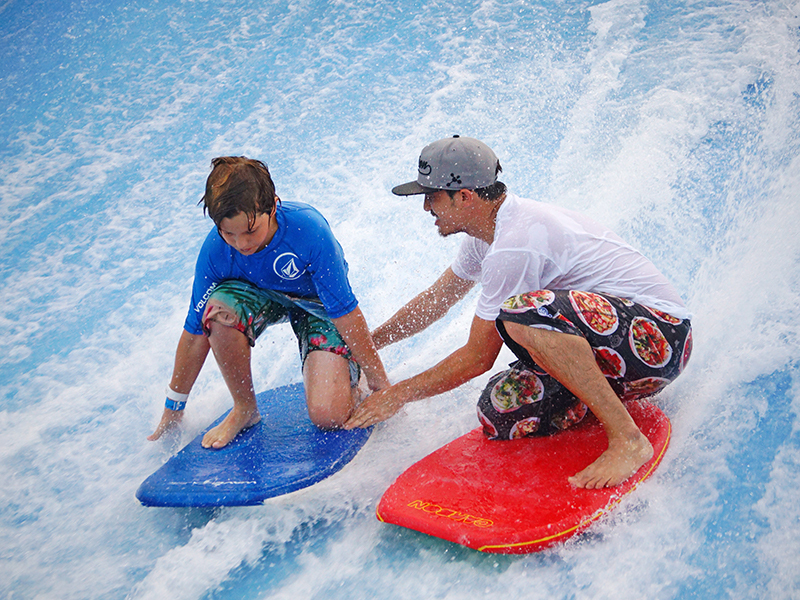 At ADG, we are invested in the safety, success and well being of the FlowRider® surf ride. Our job is to pass along this love and therefore success to our clients that end up purchasing, managing and maintaining one of these amazing surf simulators. This is why we recommend that you hire staff that is totally dedicated to your FlowRider attraction. A typical waterpark has a collection of water slides, kiddie pools, wave pools, perhaps a lazy river and some interactive play areas sprinkled about. Along with some hangout or cabana areas, all of these pieces are part of a proven “formula” of attractions that can entertain friends and families all day. All the slides and rides, a.k.a. thrill-based rides, require multiple operators and lifeguards’ attention, hence most waterparks have a “station rotation” schedule in place so that the entire staff can physically change locations in the park throughout their long shifts. This helps the park’s employees avoid plateauing into a tired, “bored” or “zone out” mode while on the job. This is obviously of utmost importance for the safety of your waterpark patrons. With the FlowRider zone though, we recommend a “dedicated staff” approach. With a dedicated staff, the interaction between each patron and staff members on the wave will be super charged and exciting. The level of staff member involvement will be totally different from any other attraction in the park. These chosen staff members should be flowboarding enthusiasts that aim to make each guest experience great. Not only does this approach increase the level of safety for your patrons on the attraction, it also gives them an experience they won’t forget and one that they will want to have time and time again. If you’re wondering about how to get this wonderful, enthusiastic, knowledgeable staff together, we can help you with that. At the time of your attraction’s commissioning, we will train your “chosen ones.” We suggest that people hired to run your FlowRider have experience riding, or show a willingness and enthusiasm to learn to ride. Selection of the right personnel is critical to take your guest experience to the next level! We also have Training Specialists on our staff, so whenever your team needs a refresher course or your team has experienced some turnover, we can re-train! You just have to get us to your site and allow us access to the wave!